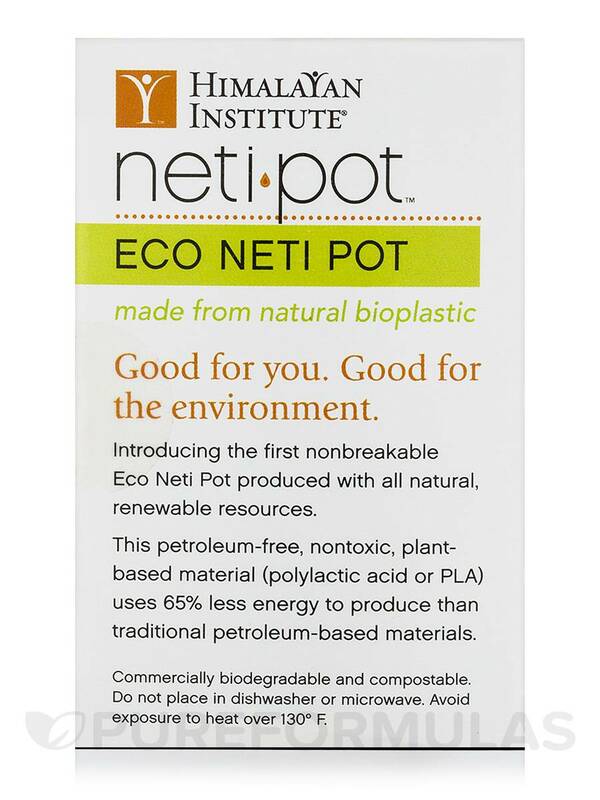 Introducing the first nonbreakable Eco Neti Pot produced with all natural‚ renewable resources. The nasal passages contain one of our body's first lines of defense against disease. They are lined with a thin layer of mucus that traps dirt‚ dust‚ pollen‚ germs‚ and other airborne particles. If the delicate balance of this mucus lining is not maintained‚ it becomes easier for bacteria‚ viruses‚ and other irritants to penetrate the nasal lining and cause problems. Nasal irrigation helps wash these impurities and excess mucus out of the body. Recent studies have shown that nasal irrigation is effective in improving the symptoms and health of patients with sinus problems. This petroleum-free‚ nontoxic‚ plant-based material (polylactic acid or PLA) uses 65% less energy to produce than traditional petroleum-based materials. 1) Clear the nostrils and start the day breathing freely. 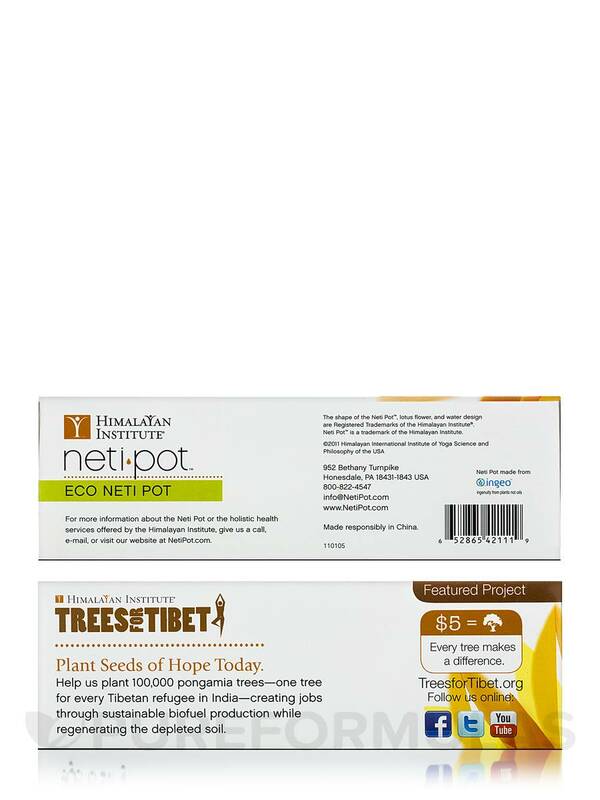 3) Rid nostrils of allergens. 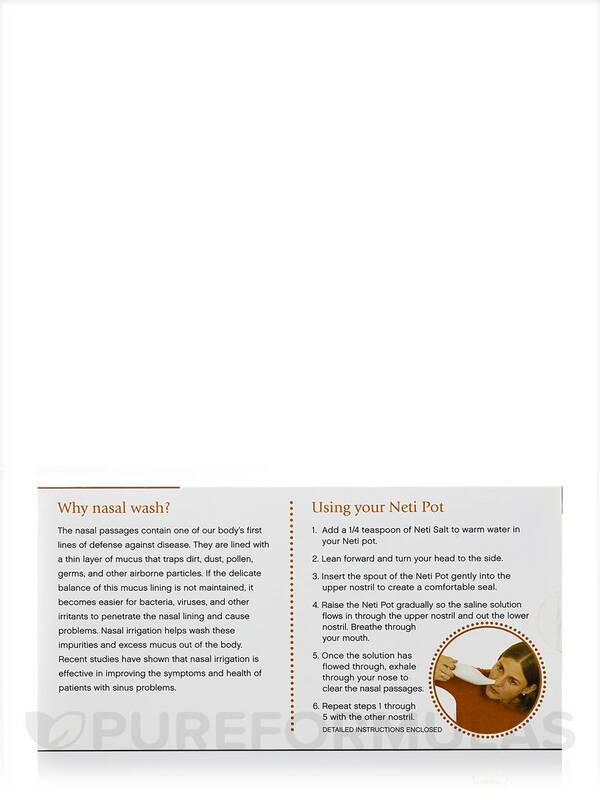 4) Cleanse the nasal passages of dust. 6) Dissolve mucus build up in dry climates. 7) Improve the flow of breath before exercise or relaxation. 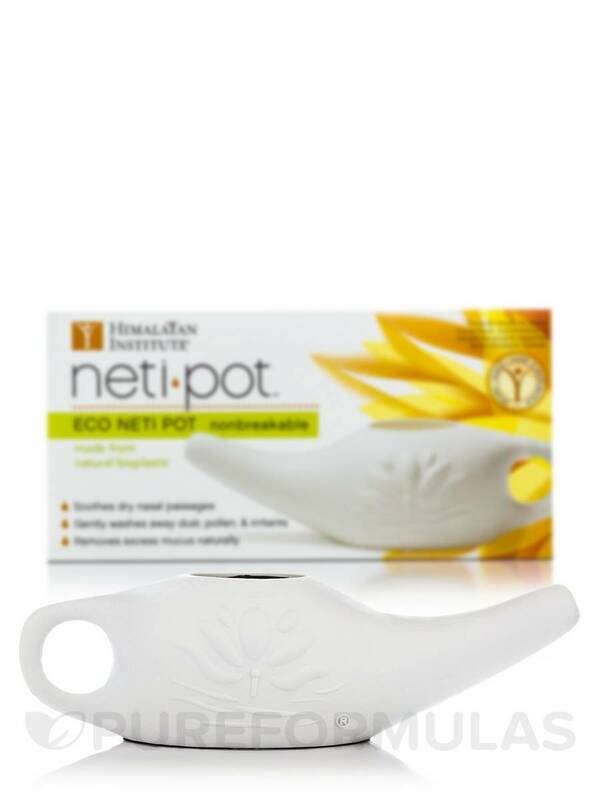 1) Add a 1/4 teaspoon of Neti Salt to warm water in your Neti pot. 2) Lean forward and turn your head to the side. 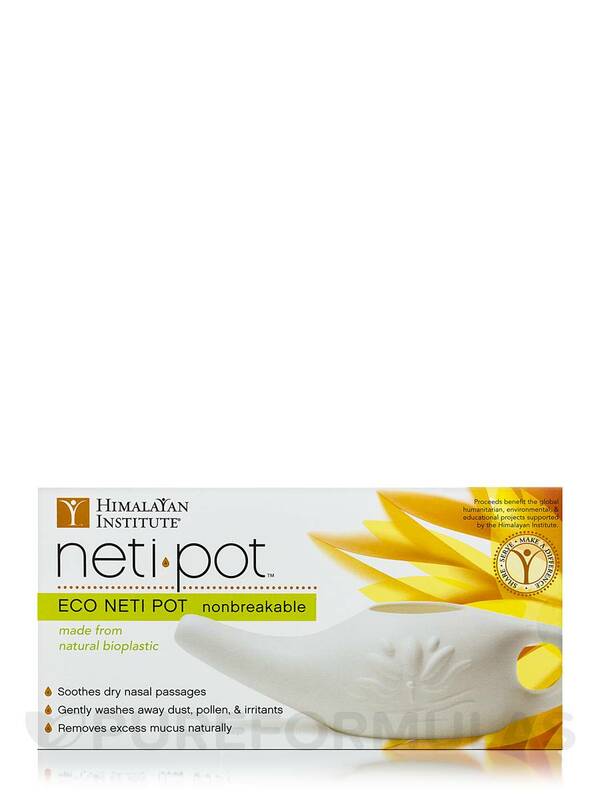 3) Insert the spout of the Neti Pot gently into the upper nostril to create a comfortable seal. 4) Raise the Neti Pot gradually so the saline solution flows in through the upper nostril and out the lower nostril. Breathe through your mouth. 5) Once the solution has flowed through‚ exhale through your nose to clear the nasal passages. 6) Repeat steps 1 through 5 with the other nostril. 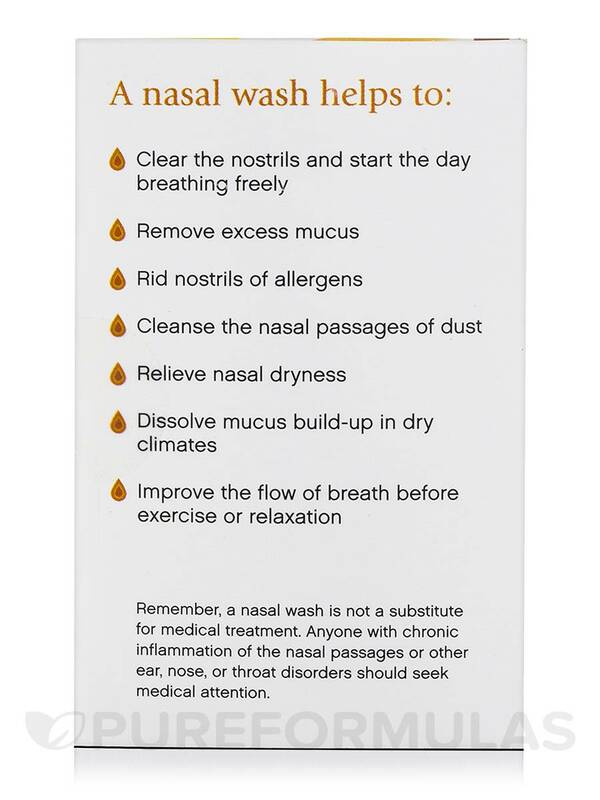 Remember‚ a nasal wash is not a substitute for medical treatment. Anyone with chronic inflammation of the nasal passages or other ear‚ nose‚ or throat disorders should seek medical attention.